Climate in the south of Uzbekistan ranges generally from warm to hot while the north experiences some of Uzbekistan’s coldest temperature drops. In December, the temperature ranges from –8 °C (18 °F) in the north to a southern temperature of 0 °C (32 °F). Since weather in Uzbekistan tends to fluctuate, temperature sometimes drop to a whopping –35 °C (–31 °F) at winter time and can be as hot as 45 °C (113 °F) during the summer months. Uzbekistan experiences hot summers and long winter. While the summer months can be very hot, humidity is relatively low in this country. The best times to visit Uzbekistan are in the months of April to June and from August until November, just avoiding the times when the weather is at its worst. Although bazaars are at their peak during the hot summer months of July and August, weather in Uzbekistan is very hot during these times. 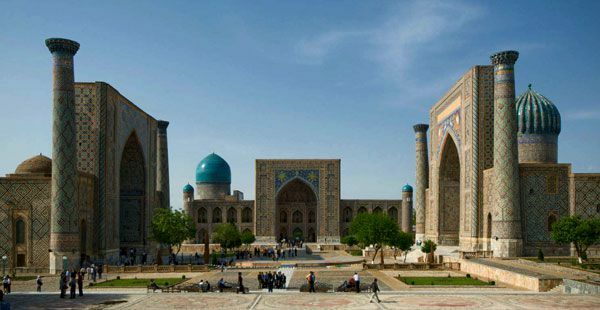 Tourists are encouraged to visit Uzbekistan in spring and in autumn to fully enjoy their vacation. The temperature during these times is perfect for strolling along the ancient cities in the morning and even experiencing the deserts at night. Rain rarely falls in Uzbekistan since it is a landlocked country. The average annual precipitation only falls to between 100 and 200 mm. It only happens during spring and in winter. There is very little rain during the summer months of July and August, making the vegetation in Uzbekistan wither or grow very slowly.